Like a good American, you trudge to the polls every so often to cast your meaningless vote in pre-ordained Federal elections. Even with much evidence that the elections are bought and paid for by the corporatocracy and manipulated through propaganda, fear and voting machine hanky-panky, we still do it. Why? And, more importantly, what can we do to change the disease-ridden, corrupt cyst-em. 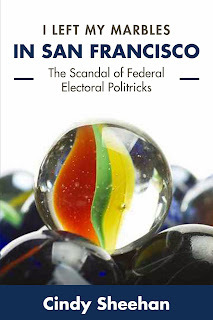 With her characteristic honesty and surprising humor, Cindy Sheehan exposes this csyt-em and gives a first-hand account of her two forays into federal electoral "politricking." The book is now out and available on Kindle with signed print books available from Cindy Sheehan. "pre-ordained Federal elections". The game is fixed, and I don't want to play anymore.